If you are cruising around in your dirty ride tomorrow, let us take care of it for you! We will be having our second car wash of the season at the Jiffy Lube on 221 in Forest. We will be getting the hoses running around 9am and will be there until noon. Stop by and say hi, put us to work and grab a presale ticket to our next bout while you are at it! See you there! A thank you to Mahone’s Wallpaper for allowing us to host our last car wash in front of their business back in July! Blackwater will also be sending some of our girls to Harrisonburg to play in the Kitten Vicious Tribute Bout on Saturday afternoon. It has almost been a year since we lost our friend Jennifer Moreland and are thankful for this opportunity to skate in her honor and memory. 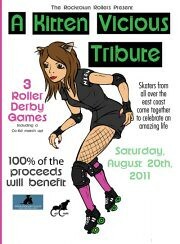 For more information about the bout, check out the facebook event page. 100% of proceeds will be donated to Cats Cradle as well as the Shenandoah Valley Spay & Neuter Clinic. Here is a photo of Jen at our very first car wash a few years back! We miss you Kitten!